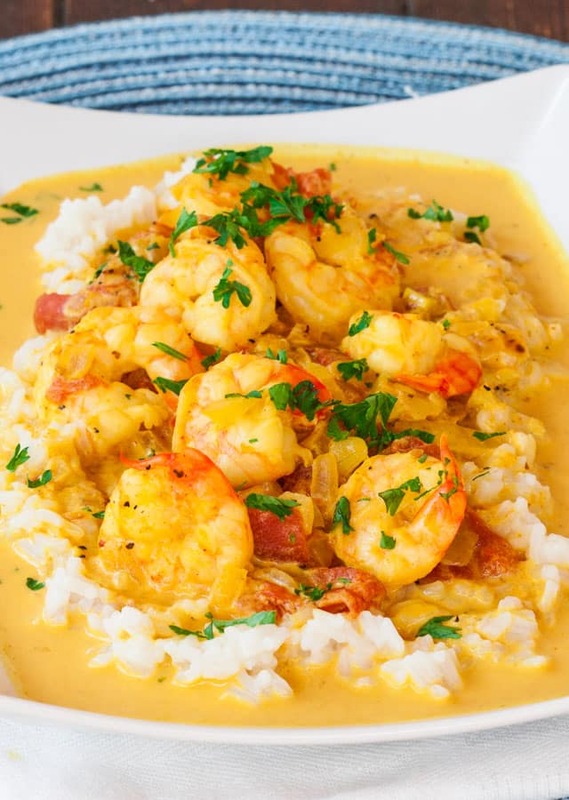 This Coconut Shrimp Curry features delicious shrimp in a coconut curry that’s perfect over cooked rice and ready in only 25 minutes! Super easy, one pot and tons of flavors! I mentioned before that I’ve been redoing some of my old recipes and this is an old recipe from 2012 and it’s been one of my most popular recipes here on Jo Cooks. 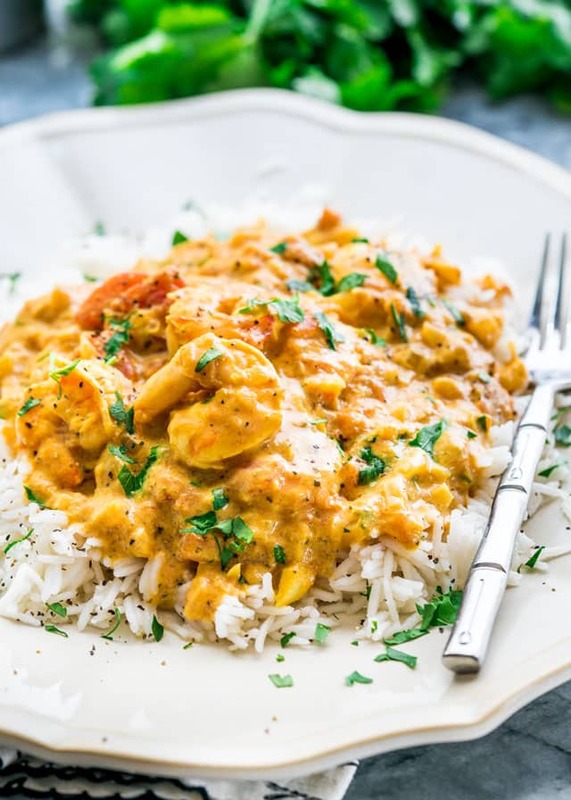 The reason is simple, this coconut shrimp curry is so delicious and easy to do, you could literally have this on your dinner table in no time at all. Forget take-out, forget going out for dinner, make this curry right at home. If you like curry dishes, you will want to make this. Growing up, my mom never used coconut milk in anything, so it’s not common at all in our cuisine, but I like to experiment and try different types of dishes. This is why I love this job so much, I get to play with ingredients, and try and come up with all kinds of interesting and delectable dishes. When I started this blog over 6 years ago, my husband asked me if I’m afraid that I’ll run out of recipes. I laughed and said there’s no way I will ever run out of recipes. Yes, I’ll run out of the recipes I knew personally, but there are so many different types of cuisines out there, it’s basically impossible to run out, unless you are afraid to try different things. But not me, I’ll try anything once, if I like it I’ll have it again, and if I don’t, well at least I can say I tried it. 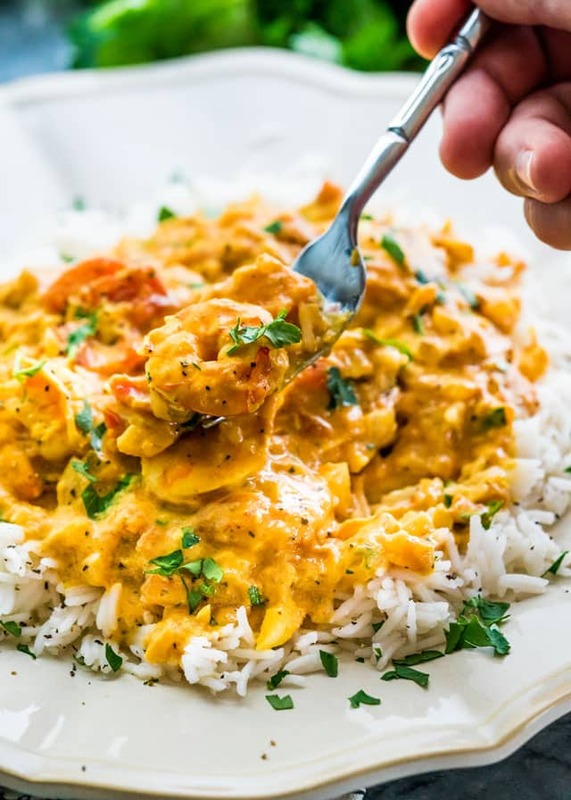 This curry though is quite simple, and you get that gorgeous yellow color from the turmeric. If you’ve never cooked with turmeric before it’s a bit bitter in flavor, but it’s mildly aromatic and has scents of ginger or orange. If cooking with turmeric, make sure you don’t overuse it because it is slightly bitter and it has a note of medicinal powdery aftertaste, if overused. That’s why we only need a little bit, but you also need some curry powder and some ground coriander in this dish. Ground coriander, on the other hand, has a sweet and aromatic taste with a touch of citrus. Curry powder also gives your food a nice yellow color and it also taste a bit bitter. One thing to note about curry powder is that it is indeed a blend of several spices which include, turmeric, coriander, cumin, fenugreek, red pepper and others, so if you don’t have any you could always make your own. 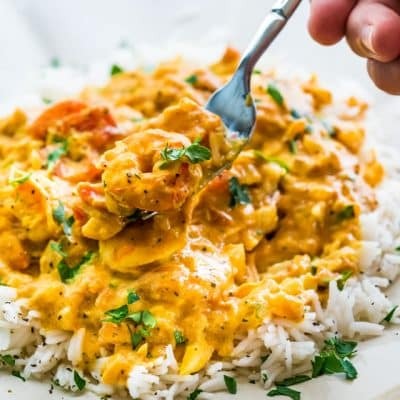 This Coconut Shrimp Curry features delicious shrimp in a coconut curry that's perfect over cooked rice and ready in only 25 minutes! 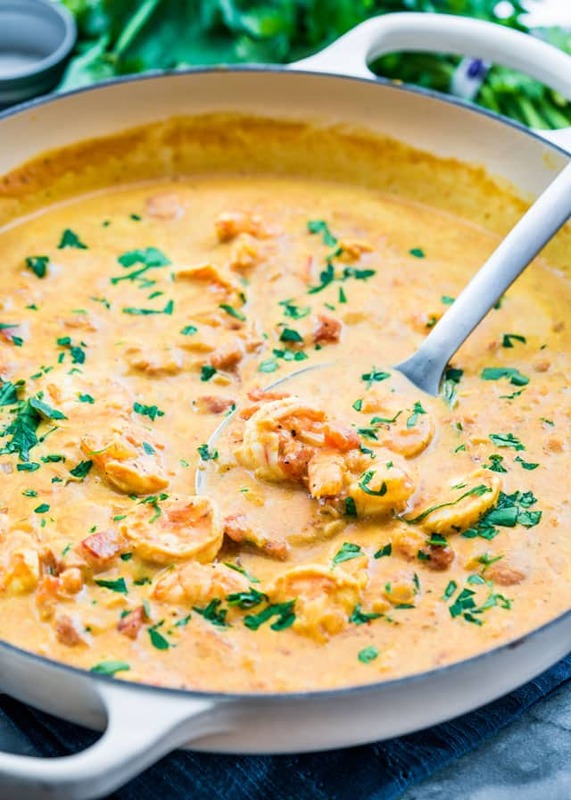 Super easy, one pot and tons of flavors! In a small bowl toss the shrimp with the marinade ingredients. Cover with plastic wrap and refrigerate for 10 minutes. While the shrimp is marinating, heat the oil in a medium size skillet. To it add the onion, and cook for 2 or 3 minutes until the onion softens and becomes translucent. Stir in the garlic, ginger, pepper, salt, coriander, turmeric and curry powder. Cook for another minute. Add the diced tomatoes with juices and all, the coconut milk, stir and bring to a boil. Cook for about 5 minutes stirring occasionally. Add the shrimp with the accumulated juices from the marinade and cook for another 2 minutes or until the shrimp is pink and cooked through. Serve over hot rice and garnish with cilantro or parsley. Recipe originally shared September 2012. Quick, easy and very tasty! Will try another time with haddock and paneer! This was delicious and had just the right spicey flavor. This turned out great. I added some zucchini and yellow squash to get in more veg. I ended up adding it right after the tomatoes, but I think in the future I’ll add them to the onion and spice mixture and stir them around for a minute before adding liquids. This definitely had enough spice for us! Yum! Good curry flavor, needed a dash more spice. Nothing a few splashes of red chili flake couldn’t handle. Put this over basmati rice. Just regular plain canned tomato sauce, correct? You can use 14.5oz! It will come out a bit more tomato-y but just as delicious. Tomato paste isn’t liquidy enough for this recipe.